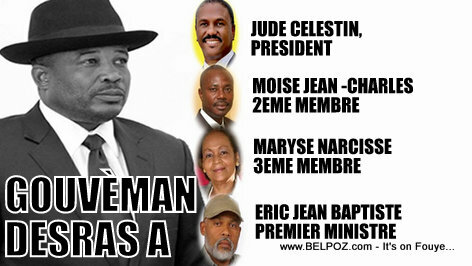 Haiti Elections Update -- Former Senator President Desras Simon Dieuseul believes he has the perfect solution for Haiti: KICK Martelly out and form a new 'College de Gouvernment' with Jude Celestin president, Moise Jean Charles and Maryse Narcisse as Members and Eric Jean Baptiste as Prime Minister... Say what??? « FLASH: Haiti Elections - Exit Poll Places Jovenel Moise in 4th Position, Should Jovenel be AFFRAID? mesye wo, garde kijan pouvwa fe haitien anrage non. sak pran sedras la. madam maniga te reve li prezidan, men desrat yeux cler lap reve, mwen ta rnemen konnen de kel droit misye ap vomi konsa.